Female English acoustic 'farm-folk'. Pure-hearted, poignant, naughty but nice. Magic music with compelling lyrics. 8. Who Understands the Land? Rambling English countryside, ancient towns and villages, summer folk festivals and midwinter solstice gatherings have all hosted the delicious harmony singing and superb musicianship of Yvette, Michelle, Abbie and Bronwen and for the first time, all four of them feature on this luscious album alongside the vocal and instrumental talents of Jo Harvey (fiddle), Jane Harwood (guitars), Shirley Screech (sax and clarinet) and Nigel Pope (guitar and lute). Yvette's album features songs inspired by and richly embedded in the rural landscape of Somerset. A synthesis of intelligent lyrics, beautiful music and a personal take on farming today, interwoven with fun, folksong and fantasy. It’s a unique view from the Somerset farmhouse kitchen window and a visit to those carefree days when we all did things just for ‘devilment’! 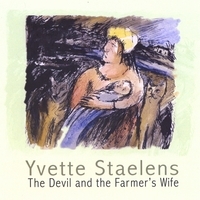 We all have many identities, Yvette Staelens, musician, mother, singer, composer, arranger, community choir leader, part-time senior lecturer at Bournemouth University is also known as Mrs Totterdell, dairy farmer’s wife of Higher Wrantage Farm in Somerset. Time to sample some ‘Farm-folk’ ? Go on you know you are worth it! Yvette may be known to some readers as one half of the perversely contrarily-named Roots Quartet, who for the past 20 or so years (albeit in several wildly differing incarnations) have been ploughing their own unassuming yet individual folky furrow down in Somerset with occasional forays into touring folk venues nationwide. The "band" as such is "resting" at present, it would appear, while Yvette concentrates on other activities such as being a farmer's wife and leading singing workshops etc. - and presumably promoting her latest CD release. It's nominally a solo album, but it also features various instrumental and vocal contributions from Yvette's long-term collaborators Abbie Lathe & Bronwen Harrison (both ex-RQ) and Michelle Hicks (present-day RQ), with Nigel Pope, Joanna Harvey, Jane Harwood and Shirley Screech. The CD presents an almost casual little programme of what Yvette calls "farm-folk", a sequence of eight songs, all of Yvette's own creation (and by the way, it does not include the song you might expect from the album's title!). These compositions serve to bring to our attention the plight of the modern farmer through intriguingly-crafted observations on the rural way of life which build upon the legacy of English folksong. Not exactly in the manner of Show Of Hands, although the press release hints at a comparable sensibility in Yvette's take on matters rural. I suppose you might say that the nine tracks form a kind of patchwork of fields growing contrasting crops ... and together, the collection is described as "a personal view of farming today, interwoven with silliness, folksong and fantasy". The opener, Crazy Aunt Cottage (ostensibly a kind of new-age lullaby, but its stridency is more likely to keep the babe awake!) doesn't quite connect for me, but thereafter we get down to business with some simple yet powerful commentaries and I love the rest of the album. The Bluebell Herd was inspired by the FMD catastrophe, The Sea And The Soil examines (in divine vocal harmony!) the true cost of food and the concept of wastage within the global economy, and – probably finest of all - the solo acapella Who Understands The Land? persuasively addresses our underappreciation of farmers. Sedgemoor 1685 is a stirring vision of "the pitchfork poor called to war", and Road To Araby a kind of farmer's wishful dream I suppose, while the stark tale of The Greyman (a co-write with Abbie) is a concise Lied-like highlight. In complete contrast, Patio Song is a deliciously vengeful barbershop-style ditty inspired by a local wifebeating! Finally, there's an unpretentious instrumental interlude in the form of a simply-conceived piano arrangement of Pretty Nancy. This disc has a very appealing homespun cottage-industry vibe, and Yvette's songs all have something important to say.